Mild, moderate, and even some severe orthodontic problems can be corrected with braces. But what if your malocclusion is caused by a skeletal issue? Although braces can move teeth, they cannot move bone. Therefore, in some cases, orthognathic surgery is necessary for long-term, optimal correction. Dr. Timothy E. Mickiewicz works in conjunction with an oral surgery specialist (OMS) to help patients with severe malocclusion achieve and maintain a healthy smile for years to come. Also referred to as corrective jaw surgery, orthognathic surgery involves repositioning the upper jaw, lower jaw, or both to optimize your occlusion (the way your teeth fit together). The purpose of this procedure is to improve your chewing function and stabilize your jaw joints, so they are resting in their proper positions. Depending on the specific case, orthognathic surgery can also open the airway, improve speech, and reduce the risk for periodontal disease. Orthognathic surgery is performed in combination with orthodontic treatment. What Conditions Can be Treated with Corrective Jaw Surgery? Of course, the best way to know whether or not this treatment can help you is to see Dr. Mickiewicz for a consultation. Orthognathic surgery isn’t for everyone, but it can be a tremendous help for those who need it. During your initial consultation, Dr. Mickiewicz will visually assess your teeth and gums, and will palpate around the jaw joints to feel for any abnormalities. X-rays and scans will then be taken so that the jawbone and joints can be evaluated. 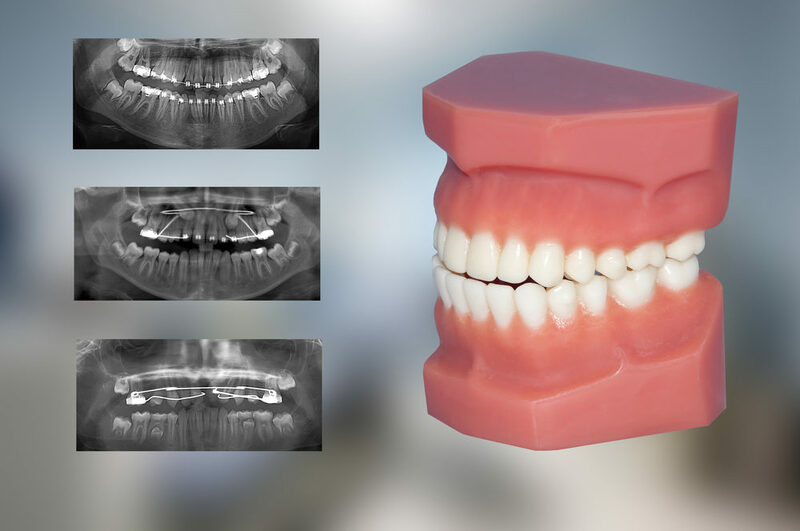 Because we utilize advanced diagnostic technology, Dr. Mickiewicz can use these radiographs to intricately plan your treatment, and share your records with the oral surgeon. Comprehensive dental care is a team effort. Therefore, before the day of your surgery, you will have a consultation with the oral surgeon. He or she will use the diagnostic images to virtually plan your surgery, so that the necessary steps can be outlined before the first incision is ever made. Typically, the first phase of treatment will be orthodontics. Therefore, you will wear braces for the amount of time specified by Dr. Mickiewicz before undergoing your surgery. Once your orthodontic phase is complete, your surgery can be scheduled. The surgical procedure is generally performed in a hospital, ambulatory surgical center, or the oral surgery office. This way, the appropriate anesthesia can be administered for your comfort. During the procedure, the oral surgeon will reshape the jaws by adding or reducing bone where necessary. Surgical materials, such as screws, plates, wires, and bands may be used to stabilize the jaws in their new positions. The entire surgical process typically takes a few hours to complete. It is a complex procedure. However, when performed by a skilled and knowledgeable surgeon, this treatment offers a significant improvement in quality of life. If you are experiencing any of the symptoms mentioned above, or if you suspect you may be a candidate for corrective jaw surgery, schedule a consultation with Dr. Mickiewicz. To reach us, you can call our Sacramento, CA office at (916) 469-9178 or contact us online.